Begun several years ago, The Chronicles Project is the creation and journey of German composer and keyboard player Malte Rathke. Failing to find enough local support, Rathke turned to the Internet for international help in bringing his music to realization. With this positive feedback, TCP developed into a full studio project with an international cast of players from Rathke's Germany to Italy and Greece to Sweden and the UK. You'll likely not recognize the names, but their talent is self-evident on the first TCP album, When Darkness Falls. Essentially, The Chronicles Project is melodic progressive power metal in the European tradition, presenting a fantasy sci-fi conceptual story. Straight from label press material: "The immortal soul gatherers Twilight, Nightfall, and Sirelius came to Earth to collect the souls of the deceased and deliver them to the sleeping god Isaari. But an ancient pact and the murder of the mortal Mary threaten not only their mission, but also the equilibrium of forces and therefore the existence of mankind." Yeah. I know. It sounds weird. But heavy metal and sci-fi go together like chocolate and peanut butter. As for the music, whatever his criteria or assumptions were, Rathke appears to have stuck with the fundamentals first. Start with a solid foundation of heavy metal with melody, harmony, and groove. Toss in some speed for power metal, and then some intrigue in the arrangements for progressive metal. But it's not over complicated stuff, a manipulation of tempo and time signatures here and about. Additionally, Rathke made the important choice to go with clean singers who have strength, melody and emotion for a pleasing presentation. Also, knowing his heavy metal, he made sure there was an abundance of brisk riffage and blazing solos. As for himself, his keyboards, Rathke brings both atmosphere and orchestration to the arrangements, yet limited amounts of solos. However, listening to the piano at the start of The Dark Symphony or the orchestration of Until You're Mine one can tell that the arrangements were built upon his keyboard melodies. Bottom line: it all works well together and When Darkness Falls is pleasing and entertaining listen. It's also a long one, nearly 70 minutes. I found that a bit overwhelming. It's not that the music isn't enjoyable, but after about 45 to 50 minutes, I wasn't paying that much attention anymore. The length also had the negative of coming away from the listen not remembering with any interest any particular song or portion of the album. There's also some narration you have to catch. I'm sure it's meant to be helpful, carry the story along, but I had the natural inclination to ignore it. But I'm also usually doing other things while listening, multi-tasking as it were. Nevertheless, these are mostly personal scruples and do not take away from the Rathke and friends' genuine and entertaining accomplishment: When Darkness Falls is a fine first effort. 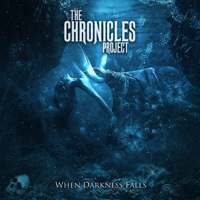 The creation of composer and keyboard player Malte Rathke, The Chronicles Project's When Darkness Falls is an entertaining album of progressive power metal featuring some talented international players.